I know that it’s the peak of summer in India now and for once, I feel happy that I am not there at this time of the year. You literally melt in front of the stove because of the heat. Though its tough, I always feel blessed. When you look at the guy who irons your clothes, your maid mopping the floors or the cooks in restaurants, you know your life is so much easier. They have no choice but to do their work in that heat. My work is so much lighter compared to theirs and you automatically count your blessings. Life really keeps you humble over there. 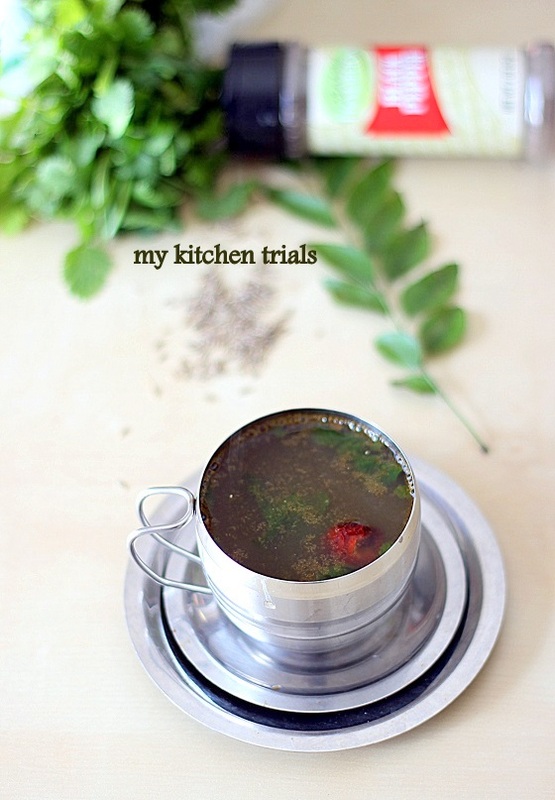 Though people in Chennai cannot think about hot- hot pepper rasam now, it suits very well for the rainy days we have been having here.Give it a try and you will be hooked! Crush the coriander leaves, garlic, pepper and jeera into a coarse paste. This can be done in a mixie jar or using a mortar and pestle. Add tamarind paste and chopped tomato with salt in 3 cups water and bring it to a boil. If you are using freshly squeezed tamarind juice, reduce the water added so that there is 3 cups in all, including the tamarind juice. Add the ground paste and cooked toor dal. Boil for 5 minutes. Taste test and adjust seasonings. Boil for another 5 minutes, adding more water if required. Take off the heat and keep aside. For the seasoning, add ghee in a small pan. Once its hot, add the mustard seeds, red chillies and curry leaves. Once the mustard seeds to crackle, take off the heat and pour carefully onto the prepared rasam. Optional: Some people add a pinch of sugar or jaggery to the rasam when its boiling. rain r shine this is very comforting.. love the clicks..
Its raining cats and dogs in mumbai right now. And your tempting cup of rasam is all that I need in my hands right now. Making it soon!